Giovanni (di Francesco) Toscani) (b 1370-80; bur Florence, 2 May 1430) was an Italian painter who matriculated in the Florentine Compagnia di S Luca in 1424. It seems that already in 1420 he was inscribed on the rolls of the company. The name Giovanni di Francesco was virtually unknown in art historical literature until 1917, when a scholar discovered documents from 1458 and 1459 linking Giovanni to payments for a fresco lunette. This lunette, in the Loggia degli Innocenti in Florence, remains his only documented painting. Both the nephew and cousin of painters, Giovanni di Francesco may have worked in his uncle’s workshop. He was also probably a pupil of Paolo Uccello. From Uccello, Giovanni di Francesco developed a fascination with perspective and a taste for linear definition and intense facial expressions. In 1423 and 1424 he received payments for decorating the Ardinghelli Chapel in Santa Trinita, Firenze. In 1442 Giovanni di Francesco became a master in the Florentine guild. A few years later he worked for Masaccio’s pupil Filippo Lippi. The art of other Florentine painters of his day influenced Giovanni di Francesco, particularly Andrea del Castagno’s emotional, linear style and Domenico Veneziano’s explorations of the effects on color of changes in light. In the catasto (land registry declaration) of 1427, Toscani described himself as a cassone painter ('cofanaio'). Toscani was buried in Santa Maria del Fiore in Florence. A cassone is an Italian chest large enough to normally be used directly from the floor of a room. It needs no stand, table, or brace. On average, they measure roughly 1.5 meters across, .5 meters tall, and .5 meters deep and can weigh several hundred pounds when loaded. According to the Encyclopedia Britannica, the cassone was typically a marriage chest, given to the bride and groom at the time of their wedding by the family of the bride. executed by mere carpenters and joiners, cassone were made or decorated by painters recognized as experts in their own lifetimes, and revered as grand masters today. Made of only the finest woods, and decorated with hundreds of man-hours worth of master carving, cassone represented the height of opulence in home furnishings. Gilded with gold and carrying the wealth of merchant princes to the altar, cassone represent for us an attitude and a style that was uniquely the Italian Renaissance. floor of a room. It needs no stand, table, or brace. On average, they measure roughly 1.5 meters across, .5 meters tall, and .5 meters deep and can weigh several hundred pounds when loaded. According to the Encyclopedia Britannica, the cassone was typically a marriage chest, given to the bride and groom at the time of their wedding by the family of the bride. Often, the cassone will contain the bride’s dowry. Cassoni were traditionally made in pairs, and often were elaborately decorated, sometimes with the heraldry of the bride and the groom. The cassone itself was highly decorated. In the 15th century, they were most often painted, while heading into the 16th century, sculpted or intarsiated wood became the prefered medium. The painted cassoni had scenes from everyday life or from mythology, usually with a moral pointed at the bride. Other themes on the cassoni included battle scenes and themes from ancient mythology and literature. Amid the chaos of the Middle Ages, the institution of marriage continued to develop. There was nothing of romance in Italian Renaissance marriages. Daughters and their virtue were family assets, and they were highly prized and carefully traded. A well-planned marriage could lift a family up on the social ladder. Merchants bound large trading decisions with marriages. Alliances were sealed, and property was conveyed by marriages. The weddings associated with these marriages symbolized the social station, power, and wealth of the two families that were being joined. As such, they called for all of the pageantry and opulence that the two families could manage. In a sense, the cassone can be seen as a typical example of the extreme opulence and expense that came to be demanded of a wedding in the Italian Renaissance. Sts. 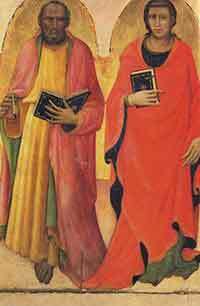 Matthew and John, James and Antony the Abbot, Museo dell'Opera del Duomo, Prato. This article incorporates material from the Wikipedia articlepublished under the GNU Free Documentation License. Podere Santa Pia is a very nice holiday home situated in the green hills of the Maremma near the tiny medieval town of Cinigiano, close to Montalcino and the Abbey of Sant'Antimo.